Not to be confused with Charing Cross tube station or Charing Cross (Glasgow) railway station. Charing Cross, also known as London Charing Cross, is a central London railway terminus in the City of Westminster, England. It is one of 18 stations managed by Network Rail and all regular trains serving it are operated by Southeastern. 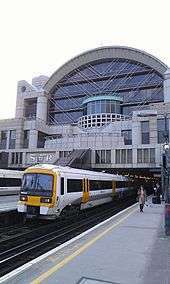 It is the fifth busiest rail terminal in London. The office and shopping complex above the station is formally known as Embankment Place. The station takes its name from its location next to the central London road junction of Charing Cross. The front of the station faces the Strand, while at the other end is the northern end of Hungerford Bridge, which is crossed by all trains serving the station. Ticket barriers control access to all platforms, although the bridge entrance has no barriers it is only open to passengers during the morning peak hours. Therefore, there are regular ticket inspections carried out on the bridge. Charing Cross is the London terminus of the South Eastern Main Line. All regular services are operated by Southeastern which provides the majority of commuter/regional services to South East London and Kent. The original station building was built on the site of the Hungerford Market by the South Eastern Railway and opened on 11 January 1864. The station was designed by Sir John Hawkshaw, with a single span wrought iron roof arching over the six platforms on its relatively cramped site. It is built on a brick arched viaduct, the level of the rails above the ground varying from 13 feet (4.0 m) at the north-east end to 27 feet (8.2 m) at the bridge abutment at the south-east end. 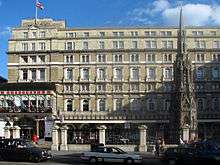 A year later the Charing Cross Hotel, designed by Edward Middleton Barry, opened on 15 May 1865 and gave the station an ornate frontage in the French Renaissance style. Contemporary with the Charing Cross Hotel was a replica of the Eleanor Cross in Red Mansfield stone, also designed by Edward Middleton Barry, that was erected in the station forecourt. It was based on the original 13th-century Whitehall Cross that had been demolished in 1647. Distances in London are officially measured from the original site of the cross, now the statue of Charles I facing Whitehall, and not from this replica cross. The condition of the cross deteriorated until it was in such a vulnerable condition that it was placed on the English Heritage At Risk Register in 2008. A ten-month project to repair and restore the cross was completed in August 2010. This work included recreating and attaching almost 100 missing ornamental features including heraldic shields, an angel, pinnacles, crockets and finials; securing weak or fractured masonry with stainless steel pins and rods and re-attaching decorative items which had previously been removed after becoming loose. A 77-foot (23 m) length of the elegant original roof structure, comprising the two end bays at the south of the station, and part of the western wall collapsed at 3:45 pm on 5 December 1905. 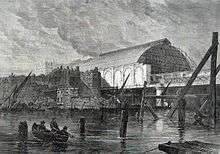 A gang of men were employed at the time in repairing, glazing and painting the section of roof which fell. Shortly after 3:30 pm, the roof emitted a loud noise, which was when someone noticed that one of the main tie rods had broken and was hanging down. Part of the roof began to sag and the western wall began to crack. It was another 12 minutes before the collapse occurred, which enabled trains and platforms to be evacuated and incoming trains to be held back. The roof, girders and debris fell across four passenger trains standing in platforms 3, 4, 5 and 6, blocking all tracks were. The part of the western wall that fell had crashed through the wall and roof of the neighbouring Royal Avenue Theatre (now the Playhouse Theatre) in Northumberland Avenue, which was being reconstructed at the time. Six people died (two workmen on the roof, a W.H. Smith bookstall vendor and three workmen on the Royal Avenue Theatre site). At the Board Of Trade Inquiry into the accident expert, witnesses expressed doubts about the design of the roof, even though the cause of the failure was attributed to a faulty weld in a tie rod. Consequently, the South Eastern and Chatham Railway decided not to repair the roof but to replace it. An enormous travelling timber gantry had to be constructed to take the remainder of the station roof down safely. The replacement was a utilitarian post and girder structure supporting a ridge and furrow roof. The curve of the original roof design can still be seen on the interior brickwork. The station was re-opened on 19 March 1906. Following bomb damage in the Second World War, the hotel received extensive repairs in 1951, ten years after being bombed. In general, this consisted of a whole new set of top floors. The elaborate Mansard roof of the upper floors of the hotel was rebuilt in a plain neo-Georgian white brick. In April 2014, the station held a celebration to mark the station's 150th anniversary which included a Kentish farmers market, staff in period costume, a guided walking tour and the unveiling of the new waiting room mural, produced by a local school. Services are formed using Southeastern's fleet of Class 375 and Class 376 Electrostars and older Class 465 and Class 466 Networker units. 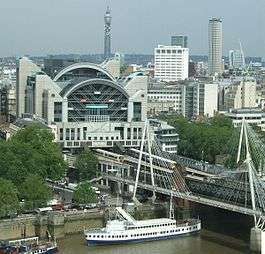 Charing Cross is served by two London Underground stations, one at each end: Charing Cross, and Embankment. Charing Cross railway station is within walking distance. Embankment and Charing Cross have an Oyster Out of Station Interchange. 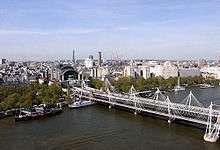 Originally Embankment was called Charing Cross, while the present Charing Cross was Trafalgar Square (Bakerloo line) and Strand (Northern line) stations, combining under the new name when connected by the new Jubilee line station in 1979. The change of name acknowledged that Strand and Trafalgar Square were closer to the station than Embankment. Note that additionally, for a short time, the stations were signed as "Charing Cross Embankment" and "Charing Cross Strand". The Jubilee line platforms are no longer served, following the 1999 extension of the line in which it was diverted to Westminster and onwards south of the River Thames. In late April 2016 there was a private proposal to reinstate the link from London Bridge to Waterloo. 1 2 3 4 5 6 7 8 "Station usage estimates". Rail statistics. Office of Rail Regulation. Please note: Some methodology may vary year on year. ↑ "Station facilities for London Charing Cross". National Rail Enquiries. Retrieved 29 May 2013. ↑ "Revealed: Britain's busiest and quietest stations". BBC News. 2015-12-15. Retrieved 2016-02-05. ↑ "Eleanor Cross restored at Charing Cross station". Rail-News.com. 9 August 2010. Retrieved 13 December 2011. ↑ "London Charing Cross". Kentrail.org.uk. Retrieved 13 December 2011. ↑ "New Southern Crossrail to make Guildford commuters lives easier". Eagle Radio News. 19 April 2016. Retrieved 30 April 2016. ↑ "London Waterloo £5bn revamp proposal suggests 'through' station link to London Bridge". getSurrey. 20 April 2016. Retrieved 30 April 2016.